While a case has been registered against Prince, no action has been taken against the mob so far. 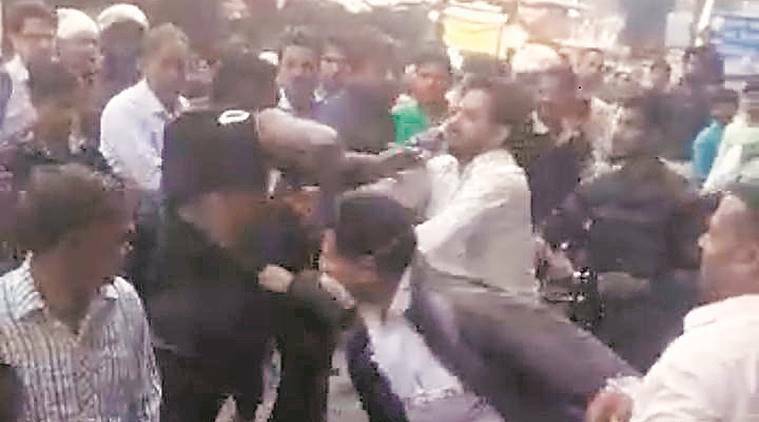 After a Nigerian national allegedly flouted a traffic rule and got into a scuffle with traffic police officers in Dwarka on the afternoon of March 18, the local public came to the officers’ rescue — armed with blows. In a 90-second video that has emerged, a group of men can be seen beating up 35-year-old Prince, tearing his shirt, as some of them say “policewaale ko kaise maar raha hai yeh?” Before and after the public takes matters into its own hands, the traffic police officers can also be seen trying to control Prince. As he is beaten up, Prince falls on his scooter, then on a passerby and a fruit stall. The beating stops and the traffic police officers re-emerge only when a local interferes between Prince and the mob. According to a police officer, on March 18, Prince, who was riding a scooter, was stopped by two traffic police officers at Dwarka Mor. “He was not wearing a helmet and when the officers stopped him and asked him to show papers, he tried to escape but couldn’t. He then hit the officers, manhandled them and tore their uniform, after which the public intervened and beat him up,” said a police officer. He said that the officers sustained minor injuries, and that the “role of the public will be inquired into”. DCP (Dwarka) Anto Alphonse did not respond to repeated calls and messages. An FIR has been filed against Prince at the behest of a complaint filed by a traffic police officer present at the spot. The case has been registered under IPC sections 186 (obstructing public servant in discharge of public functions), 353 (criminal force to deter public servant from discharge of his duty) and 332 (voluntarily causing hurt to deter public servant from his duty) of the IPC at Mohan Garden police station.